England edged a nervy encounter to launch their Six Nations campaign with victory as Wales failed to engineer a repeat of their 2008 win at Twickenham. Jonny Wilkinson and Stephen Jones landed a penalty each before tries from James Haskell and Danny Care either side of half-time put England 20-3 up. Wales hit back with a try from Adam Jones and James Hook's solo effort with nine minutes left gave them hope. 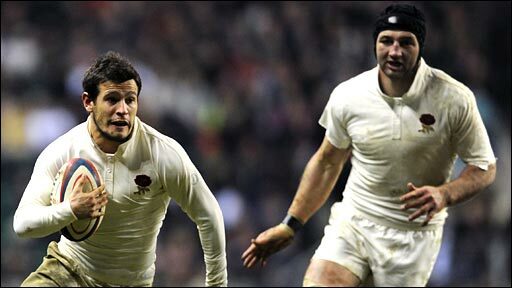 But Haskell's second try took England clear before Wilkinson's late penalty. If that put a slight gloss on the scoreline, Wales did not play consistently well enough for long enough to merit victory. But having got themselves back into it in the final 10 minutes, they succumbed to a sucker punch when Delon Armitage intercepted a Jones pass and Mathew Tait sent Haskell in for the clinching score. England will head to Rome next weekend confident of making it two wins out of two, while Wales will return to Cardiff desperate to beat Scotland to avoid their campaign coming off the rails. Their cause was fatally undermined by a yellow card for Alun Wyn Jones six minutes before half-time. In the 10 minutes the lock was off the field after a cynical trip on Dylan Hartley, England scored 17 unanswered points. Wales did rally with two converted tries of their own, but England prevailed in the frantic final five minutes. The visitors had the first opportunity to get points on the board in the seventh minute, but Hook narrowly pulled a 45m penalty wide. Wales looked the more dangerous with ball in hand, springing Martyn Williams through a gap in midfield before the veteran kicked ahead for Shane Williams, Wilkinson clearing the danger. But the Welsh were continually hampered by a poor line-out, losing three of their own throws inside the opening quarter. From one take by the impressive Nick Easter, Wales were penalised for playing the ball off their feet, and Wilkinson opened the scoring with a simple penalty in front of the posts. They might have stretched their lead from a line-out rumble after Wilkinson kicked a penalty to touch in the right corner, but Wales held up the drive as Easter was unable to ground the ball. Wales appeared to have the edge in the scrum, where England tight-head David Wilson was pinged for collapsing, but Hook pushed another penalty attempt badly wide. When the next opportunity arose after 28 minutes, after a Luke Charteris tackle on Toby Flood, Jones took over the kicking duties and levelled the scores with a well-struck penalty. But Wyn Jones handed the initiative back to England with his trip on Hartley, earning himself 10 minutes in the sin-bin and Wilkinson a straightforward penalty to edge England back in front. By the time the Lions lock returned to the fray five minutes into the second half, Wales had conceded a further 14 points as England took control with tries either side of half-time. A man to the good, they were firmly in the ascendancy approaching the interval but were twice more denied tries over the line by belligerent Welsh defence before the pressure finally told. Haskell scrambled the ball out of the back of a maul and charged over from a metre out, Wilkinson's conversion giving England a spring in their step as they headed for the dressing room 13-3 ahead. That became a 17-point cushion four minutes after the resumption when captain Steve Borthwick ripped the ball out of Welsh hands, Easter surged on and Care's pace took him through the remaining cover, Wilkinson adding the extras. Things looked ominous for Wales at that point, but they hit back swiftly after captain Ryan Jones opted for a scrum rather than a kick at goal from a penalty 10m out. A smart pass from Wyn Jones allowed tight-head Adam Jones to dive over from close range, Stephen Jones's conversion reducing the deficit to 10 points. Wales threatened to score again after 55 minutes when Hook probed a gap outside Toby Flood, but the centre's pass bounced off the chest of Tom James rather than into the wing's hands. But after a dismal 15 minutes when the game degenerated with a series of handling errors on either side, Hook's superb try with nine minutes remaining set up a grandstand finish. The centre darted between Tait and prop Tim Payne before fending off the retreating Care to score, Jones adding the extras to make it 20-17. But as Wales attacked again minutes later, a Jones pass was intercepted by Armitage, Flood sent Tait clear up the right flank and the centre's pass behind his back found Haskell on hand to score. Wilkinson converted and his third penalty with a minute left put the seal on a satisfactory opening win. England: D Armitage; Cueto, Tait, Flood, 1Monye; Wilkinson, Care; Payne, Hartley, Wilson, Shaw, Borthwick (captain), Haskell, Moody, Easter. Replacements: Cole for Wilson (60), Thompson for Hartley (60), L Deacon for Shaw (70), S Armitage for Moody (76), P Hodgson for Care (76), Hipkiss for Flood (77). Wales: Byrne; T James, Hook, Roberts, S Williams; S Jones, Cooper; P James, G Williams, Rhys Jones, Alun-Wyn Jones, Charteris, Powell, M Williams, R Jones (captain). Replacements: Bennett (for G Williams, 54), Davies (for Charteris, 54), Halfpenny (for James, 65), J Thomas (for Powell, 68), R Rees (for Cooper, 68).